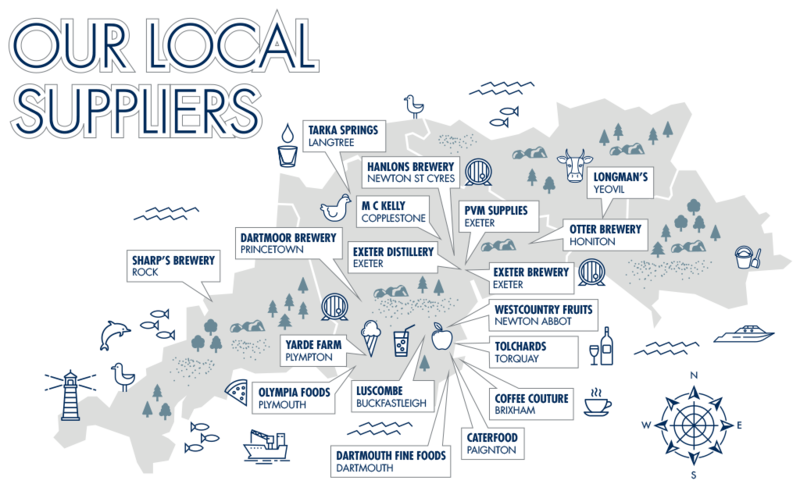 Thinking of eating out in Exeter? 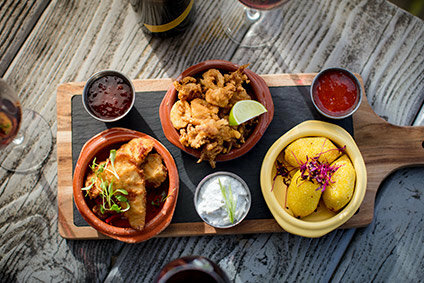 View our different menus online or download before you visit us. We have a huge range of choices available including our famous pizzas, steaks, salads, and burgers. 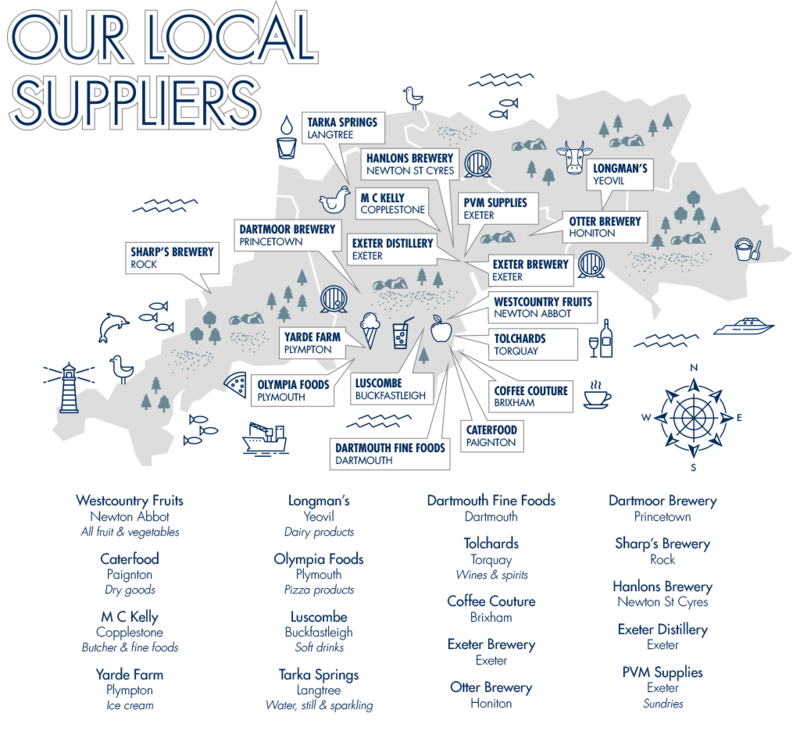 We pride ourselves on sourcing ingredients locally where possible. The fruit and vegetables used in our restaurant all come from within 15 miles of Exeter and our beefsteaks are from grass-pastured Devon cows. As a Cask Marque accredited pub, we also offer locally produced soft drinks, ales and coffee. Our buffet menus are perfect for parties of 14 or more people, and they take the stress out of organising food for larger groups. Simply let us know the number of courses you require from our buffet menus, and we will bring the food to your table for everyone in your party to share and enjoy! Sobrasada chorizo paste on sourdough with honey and thyme. Japanese chicken gyoza dumplings with carrot & ginger dip. Buttermilk-coated chicken with tomato & cumin dip. Tortilla chips with jalapeños, chunky salsa, guacamole, cheese and sour cream. Creamy Camembert encased in our pizza dough and served with onion marmalade. Served in a soft bun with lettuce, slaw and chips. Homemade with ground West Country beef, onions and spices then topped with cheese. Buttermilk chicken with lettuce, Caesar dressing, bacon and Parmesan-style cheese. Beef burger topped with pastrami, American mustard, cheese and pickles. Choose either a buttermilk chicken burger or a beef burger (Ga).Topped with streaky bacon, hickory BBQ sauce and Cheddar. Fragrant falafel burger served with grilled halloumi, roasted peppersand spiced mayo. Crispy kale & hemp seed burger with onion chutney and za’atar & harissa yogurt. Our classic beef burger wrapped in OTW pizza dough with tomato sauce, melted cheese and topped with pepperoni. Camembert wrapped in a beef burger and then covered in pizza dough! Please allow a little extra cooking time. 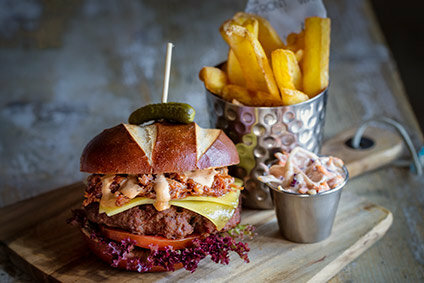 Your choice of burger served with chips, garden salad and slaw instead of a bun, at no extra charge. Swap to falafel burger (V) or kale burger (V)instead of a beef burger. Our famous handcrafted pizzas made with your choice of 12-inch standard base or 16-inch ‘dustbin lid’. Unless otherwise stated, all our pizzas have a rich tomato sauce and a mixed mozzarella and Cheddar topping. All our pizza cheese is vegetarian and can be swapped for a vegan alternative on request. A gluten-free pizza base is also available. Your favourite three toppings on our tomato & cheese base. Cherry tomato halves, mozzarella and basil oil. Pulled ham hock and juicy pineapple chunks. For every Hawaiian pizza we sell, we donate 50p to our Making a Difference scheme. Loaded with slices of our smoked pepperoni. Beef chilli con carne base, jalapeños, nachos and Mexican cheese sauce. Our take on a classic with mozzarella, Cheddar, blue cheese and black cheese. Shredded confit duck with cucumber, spring onions andChinese hoisin sauce. Basil pesto base with ribbons of courgette, grilled asparagus and finished with Parmesan-style cheese and pea shoots. Crumbled goat’s cheese with spinach, topped with toasted pine nuts and sun-dried tomatoes. A spicy mix of peppers, red onion, jalapeños, sweetcorn, mushrooms and a dusting of cayenne pepper. Pulled ham, pepperoni, pork meatballs, salami and BBQ chicken. A rich mix of chorizo, smoked pepperoni and salami sausages. A meat-feast of pepperoni, pork meatballs, pastrami, olives, mozzarella, rocket and Parmesan-style cheese. Anchovy fillets with black olives and basil oil. Roasted Mediterranean vegetables, sun-dried tomatoes and olives, topped with rocket. Buttermilk-coated chicken with roasted peppers and Baconnaise®. Dry-smoked pepperoni and chorizo sausage with red onion, jalapeños and a dusting of cayenne pepper. Pulled ham hock, BBQ chicken and smoked pepperoni. BBQ base with pulled pork, pulled chicken and pulled ham, topped with smoked cheese. Pulled chicken, sweetcorn, herbs and button mushrooms, finished with a garlic & basil sauce. A 30-inch rectangular pizza base served in a hot metal tin and woven willow basket. Mix and match up to three of our pizza varieties. We’ve let our chefs go wild to produce a uniquely Waterfront pizza! Please ask a member of our team for details. Get the best of both worlds: order a half-and-half topping on a 16-inch ‘dustbin lid’ base. Priced at the higher pizza rate. Have your 12-inch pizza folded into a calzone free of charge. Served with grilled tomato, garlic mushroom, salad pot, chips and peppercorn sauce. Our rump beefsteaks come from grass-pastured West Country cows. 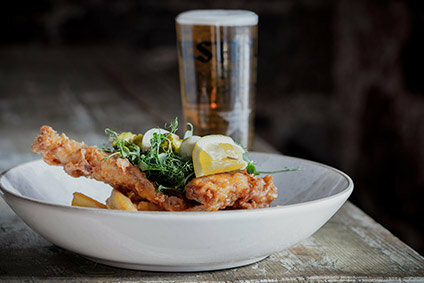 Homemade crispy battered fillet of premium fish, served with homemade tartare sauce. Our house mixed salad with cherry tomatoes and shaved vegetables, plus your choice from the options below. Combining the best seasonal ingredients, and sourced fresh today! Indulge yourself and add a topping to your side. Prices are additional to the price of the standard side dish. Made with rich and creamy West Country ice cream, covered in your choice of fudge, chocolate or strawberry sauce and topped with honeycomb and sprinkles. A sharing sundae filled with our ice cream, sauces, brownie chunks, biscuits, honeycomb, marshmallows, profiteroles and sprinkles! Tortilla chips with jalapeños, chunky salsa, guacamole and vegan cheese. Grilled garlic mushroom in a bun with spicy tomato salsa, rocket and vegan cheese, served with chips. Hemp seed & kale wrap with tomato chutney, mixed leaves and sweet potato fries. Our famous handcrafted pizzas made in your choice of 12-inch standard size or 16-inch ‘dustbin lid’. 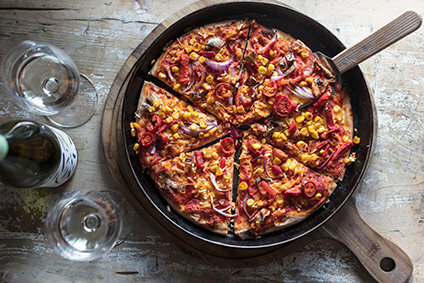 Our vegan pizzas have a tomato and vegan cheese base. Roasted peppers, vegan cheese, sun-dried tomatoes and olives, topped with rocket. Red pesto base with ribbons of courgette, grilled asparagus, olives, vegan cheese and pea shoots. Your favourite three toppings on our tomato and vegan cheese base.